New voter registration for the proposed 2018 elections have reached 484,717 HNEC reports (HNEC). 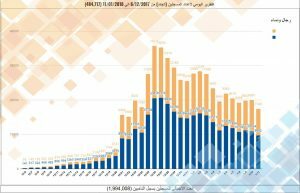 Libya’s High National Elections Commission (HNEC) has announced that up to 11 January, new voter registration had reached 484,717 voters since registration opened on 6 December 2017. When added to those already registered, it brings the total of those registered to 1,994,008. This compares to the grand total of 2,865,937 registered for the 2012 General National Congress (GNC) elections – the first Libyan elections to be held since the pre-1969 kingdom era. The 2018 figure surpasses the voter registration of 1,509,291 for the 2014 House of Representatives (HoR) elections. Voter registration got off to a slow start between 6 December and 12 December staying at under 6,000 per day. However, it shot up to over 15,000 per day by 21 December, peaking to over 35,000 on 26 December. It has averaged about 20,000 per day over the last week since the new year. More men than women have been registering. Libyans can vote using their mobiles by inserting their National ID Number, followed by #, followed by their preferred polling station and sending to the number 15015. They are able to call 1441 for free for any information, HNEC says. Libyan can register using their mobiles and their National ID Number (HNEC). HNEC has been carrying out a media and information campaign to encourage voter registration. These have included leaflet distribution including at universities and by scouts as well as information cartoons. No date has been officially announced yet for the proposed 2018 elections despite Chinese media quoting the head of HNEC as saying by September. Both sides of Libya’s polarised political divide in the east and west of the country have so far supported the elections. Although LNA commander Khalifa Hafter has told French media that he thought Libya was not ready yet for democracy.